The Aplomado Falcon was placed on the Endangered Species List in 1986 and is the last falcon in the United States currently on this list. The last known wild breeding pair of Aplomado Falcons in the United States was last seen in New Mexico in 1952. 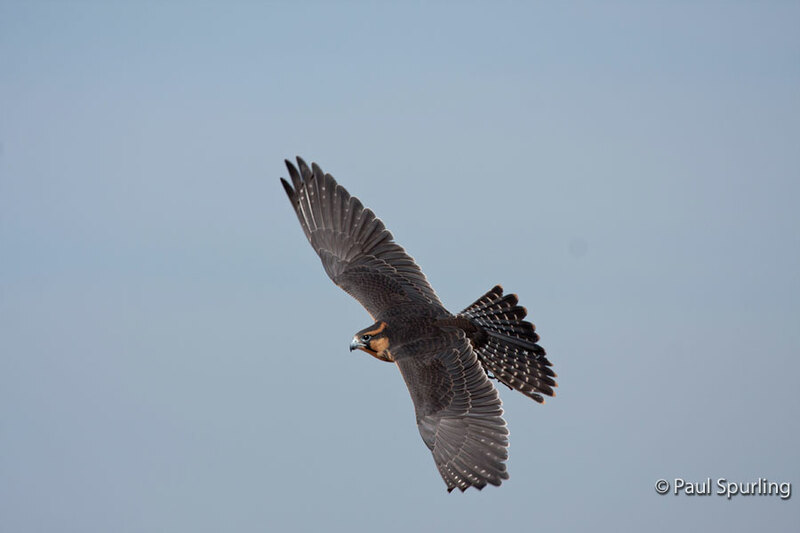 Aplomado Falcons will hunt together as pairs or in family groups, working together to pursue or flush out their prey. 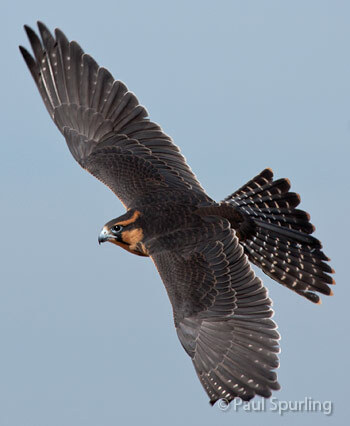 The Northern Aplomado Falcon was last seen in the American Southwest in the 1950s, leaving its niche in the grassland ecosystem unfilled for decades. 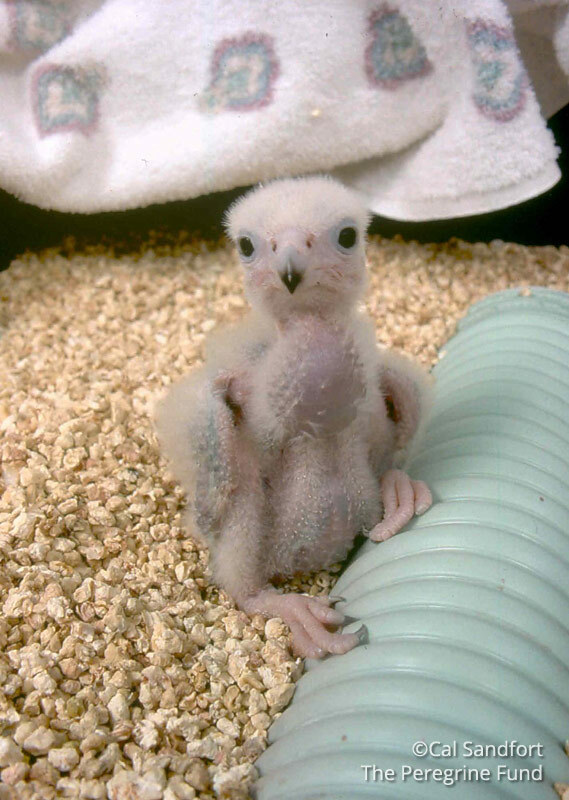 The Peregrine Fund began experimenting with breeding captive Aplomado Falcons and releasing them to the wild in the 1980s. Aplomado Falcon chicks that were produced at our World Center for Birds of Prey in Idaho were transported to Texas and New Mexico for release. 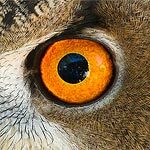 The young birds are released to the wild using a method called “hacking,” a falconry term for a process that allows birds of prey to become accustomed to their surroundings naturally right before they are ready to fly. Typically, the hack site consists of a platform on a pole or other tall structure and a box that protects the youngsters from predators. Biologists will feed the young birds for the week or so that they remain inside the hack box, then it is time to open the door and let the falcons go free. This is a tough time for the young birds as they learn to fly and avoid predators. A field crew will continue to provide the falcons with food and monitor them daily to ensure their safety. It is during this time that the young birds also learn how to hunt. After only a month or two, the falcons will become independent and disperse, or move away from, the hack site. More than 1,500 chicks have been released to the wild. As a result, there is now once again a breeding population in the United States. 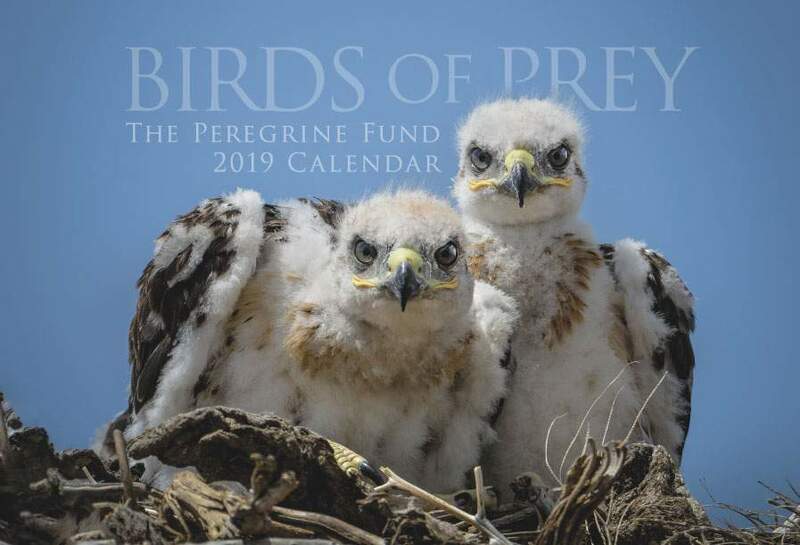 Apart from the captive breeding and release efforts, The Peregrine Fund has sought creative solutions to problems associated with the restoration of this species. 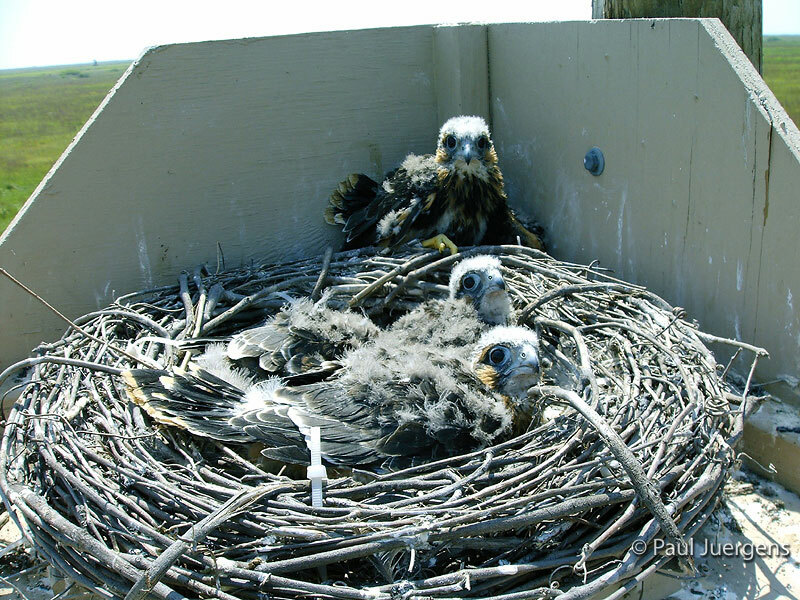 In South Texas, biologists place artificial nest structures in Aplomado Falcon habitat. The specially adapted structures have protective bars across the open front that allow the falcons in but keep nest predators, like caracaras or raccoons, out. They have proven to be popular among the falcons, with most pairs choosing to nest in one of these structures rather than a bush, tree, or power pole. Biologists work hard every year to replace old nest structures and put up new ones wherever an Aplomado Falcon pair is found. Aplomado Falcons were once found in the southwestern United States including Arizona, New Mexico and Texas, into Central and South America all the way to Chile and Tierra Del Fuego at the southern tip of Argentina. Not too long ago, however, these agile, colorful falcons disappeared from much of their North American range. 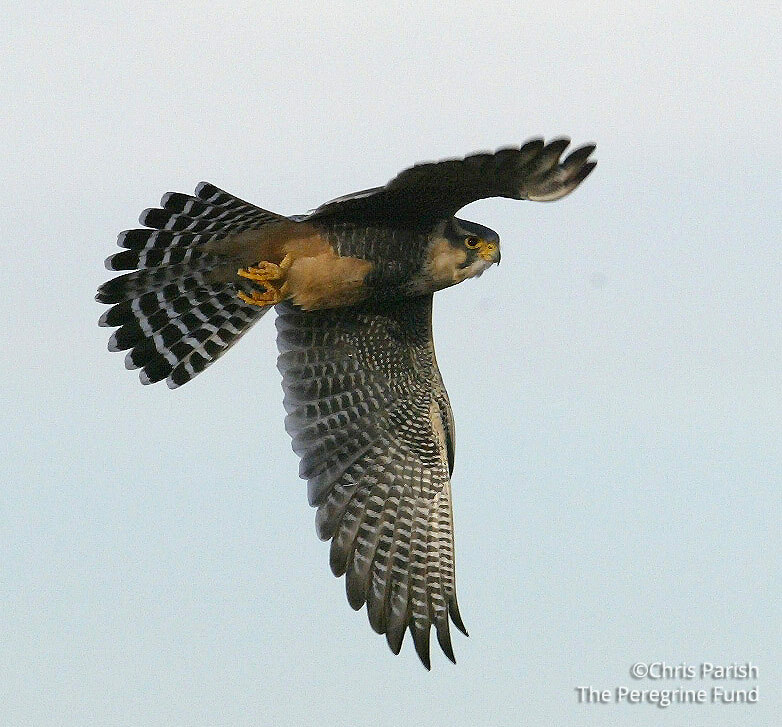 After 1952, there were no known Aplomado Falcons nesting in the United States – until The Peregrine Fund began reintroducing them into parts of their North American range in the early 1990s. As a result, there is once again a breeding population of Aplomado Falcons in southern Texas. 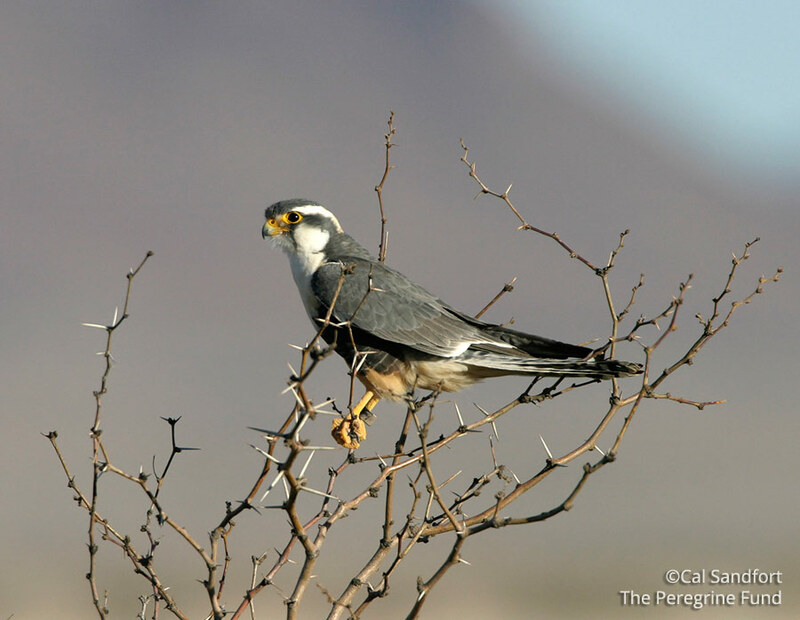 Aplomado Falcons are adapted to living in open habitats where songbirds and insects abound and where shrubs or trees, including tree yuccas like Spanish Dagger and Soaptree Yucca, are present for nesting. Prime real estate for an Aplomado Falcon includes grasslands, savannas, pastures, and shrub-steppe. If you are familiar with the landscapes of Central and South America, you know that much of the habitat there is composed of dense neotropical forest, leaving you to wonder what a grassland species is doing in thick forest. After all, it is not the best place for an Aplomado Falcon to survive. The answer is that in these regions, this small raptor is found only in select pockets of open habitat where it can sometimes be seen flying swiftly across pastures or perched on fence posts and telephone poles. Aplomado Falcons have been found living at elevations as high as 12,000 feet in the Andes Mountains from Colombia to Argentina. With their black-and-white-striped heads, orange underbelly and lead-colored backs, Aplomado Falcons are among the most beautiful and unique-looking falcons in the world. They are also some of the most fun to watch. These pointy-winged, long-tailed falcons are incredible fliers and watching one chase after prey or dive after an intruder is a sight to see. Like many baby animals, young Aplomado Falcons can by very playful. In the first weeks after they fledge from the nest, the young falcons play “tag” together, twisting, turning and diving after each other through the air. 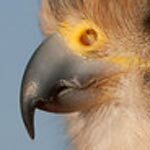 They sometimes play with sticks or yucca branches, which they carry around in their talons for a while. The youngsters then drop the sticks or take them to a spot where they can use their beaks and feet to break them apart. They also begin to chase after other birds, including ones much bigger than they are. All of this play helps make them well-practiced hunters and fliers so that by the time they are ready to leave their parents’ territory, they have the skills they need to survive on their own. As it is for all predators, life for adult Aplomado Falcons can be very challenging. They can no longer afford to spend as much time playing or flying around but must put their energy into finding and catching food, which isn’t always easy. Though they are adept hunters, their prey is small, fast and agile. An Aplomado Falcon must carefully calculate each hunt to make sure that the energy it spends actively pursuing prey is recuperated once it catches a meal. Think of it is as if you were on a long road trip and your car had only enough gas in the tank to reach the next gas station. If you took too many side trips just for the fun of it, you would run out of fuel and be stranded! If a predator runs out of energy before it gets food to replenish it, the consequences are much worse. Aplomado Falcons are not migratory and spend most of the year on their territory. When not actively hunting, they perch on fence posts, in trees, or along power poles, taking in their surroundings. During nesting season, Aplomado Falcons are quick to defend their territory against any intruders. They fly quickly after hawks, kites, vultures, or any other animal that poses a threat to their nest and young. They often stoop, or dive at the intruders, who are usually much bigger than they are! But this doesn’t stop the falcons from screaming loudly at intruders with a sharp cack, cack, cack and sometimes knocking them on the back of the head. The birds will continue this behavior until the offending animal is far enough away that it no longer poses a threat to the falcons’ young. The Northern Aplomado Falcon was once part of a dynamic wildlife community in the southwestern United States and in Mexico. Common in the early 1900s, the species disappeared from the American Southwest by 1930 as people converted wide-open grasslands – the birds’ habitat – to farms, towns, and other uses. The last known breeding pair in the United States was observed near Deming, New Mexico in 1952. Though the Aplomado Falcon is making a comeback in southern Texas, many of its northern populations are still suffering. In Chihuahua, Mexico, a once-vibrant population is now down to only a handful of pairs. Their native grasslands are being converted into farmlands and they are losing nesting habitat and songbirds to feed on. Droughts don't help matters, either, and the falcons are having a hard time surviving in the ever-changing habitat of a modern world. They need our support now more than ever. Aplomado Falcons, like most falcons, are bird hunters, but they are good at hunting a variety of other animals, too, including bats and insects such as dragonflies and butterflies. Some of the Aplomado Falcons that The Peregrine Fund has released have been observed eating land crabs and rodents. Aplomado Falcons are equipped with sharply pointed wings and an extra-long tail, which help them maneuver deftly after smaller, flying prey. They also use a host of techniques to secure their dinner. A pair or family group will often hunt together, each one taking turns to flush out prey from its hiding spot. A biologist unwittingly participated in this "group hunt" as she was studying a pair of falcons on Matagorda Island, Texas. As she approached a pair of Aplomado Falcons perched nearby, she accidentally flushed up a meadowlark that had been perched on the ground. When the meadowlark flew up, both Aplomado Falcons immediately keyed in on the small bird, chased after it, and caught it. After catching their prey, the falcons usually carry it off to a perch or fence post and pluck the feathers or fur from it before beginning to eat. Aplomado Falcons are also known to pirate food from other, larger birds. If they see another raptor carrying prey, they will chase after it, dive bomb it, and generally harass it until it drops its prey. The Aplomado Falcon can then deftly catch it from the sky! Though perhaps this method is easier than catching one's own food, it seems like a lot of work. At the beginning of breeding season, the male and female begin to court each other. Courtship behavior may include spectacular aerial displays, loud calls and quiet “e-chups” to each other, and food exchanges, among other behaviors. Like most falcons, Aplomado Falcons do not build their own nests. They use abandoned nests built by other birds such as ravens, jays, and kites. Aplomado Falcons can be found nesting at the tops of power poles and in trees, yuccas, and low bushes or even on the ground. They normally lay one to three eggs. Both the male and the female will incubate, or sit on, the eggs, though the female does most of it. The male is in charge of finding food for himself and his mate. After about five weeks, young chicks will hatch from these eggs. The rate at which these birds grow during the 40-day period from hatching to fledging never fails to impress. 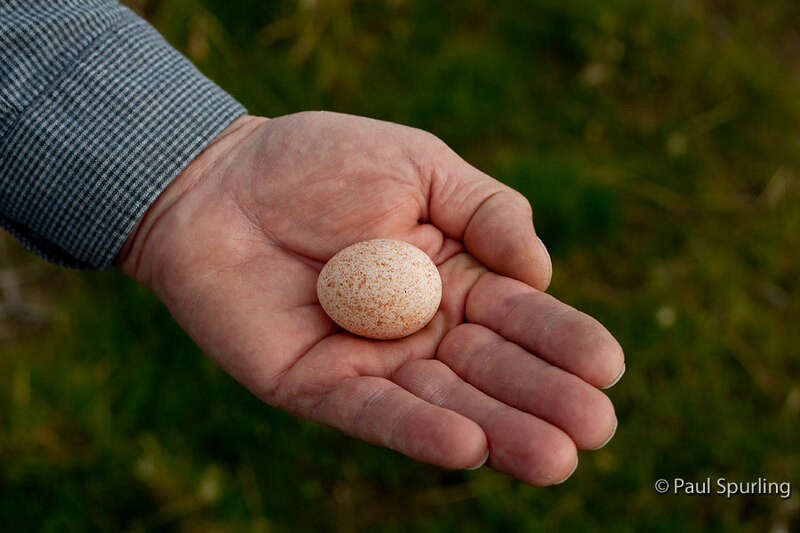 Chicks weigh about an ounce when they emerge from their shells, yet they will be full-grown when they leave the nest. By the time they fledge, these little fluff balls will be 12 inches tall and have a wingspan of up to 3 feet! Male falcons will grow up to be smaller than females, weighing about 8 ounces at fledging. Females will weigh about 13 ounces. The males’ small size means they will develop faster and often leave the nest sooner than their bigger sisters. The young falcons tend to stay in their parents’ territory for one to two months. It is a relatively easy time for them, with their parents bringing them food and defending them against predators, but they still face many risks. As they learn to hunt, they sometimes accidentally crash into fences or are hit by cars. If they spend too much time on the ground, they are vulnerable to predators, such as bobcats and coyotes. Even up in a tree, they might fall prey to snakes. When flying, they are vulnerable to capture by Red-tailed Hawks, Great Horned Owls, and other birds of prey. If a young falcon can survive the first year of its life, chances are good that it will be able to survive into adulthood and raise young of its own. Aplomado Falcons are usually able to reproduce at 2 years of age, though some records exist of 1-year-old falcons successfully raising young. Though Aplomado Falcon range does not extend into Idaho, this state is important for this species. The Peregrine Fund's captive breeding program for this species is located in Boise and is home to 25 pairs of Aplomado Falcons. Here, pairs are held in individual chambers, where they are fed daily. They are intensively observed via video monitors and their actions, such as courtship displays and food exchanges, are recorded. Biologists also look for any signs of ill health, injuries, or behavior problems. Each year, depending upon numbers required at release sites, 50-135 chicks are produced annually and most are released back into the wild in Texas or New Mexico. Sometimes biologists transport the chicks in vehicles all the way from Idaho to the release site. At other times, thanks to the generous support of LightHawk, the falcons are flown down to the release site in small private airplanes. This quicker trip is easier on both the birds and the biologists. The World Center for Birds of Prey is home to Aplomado Falcons in the education program. During our October flight shows, guests are treated to the sight of an Aplomado Falcon flying swiftly over the open fields behind the amphitheater or even maneuvering deftly among the crowd. Inside the Velma Morrison Interpretive Center, you will be able to see a replica of an artificial nest structure and release box, as well as a short video on Aplomado Falcon releases. There is also a live pair on display, giving you a close up view of this beautiful falcon.